Set of 20 bubble tube standards designated A thru T with 2 empty tubes (Grade A, Class G) and directions for use, complete in storage case. Weight: 3 lbs net; 7 lbs shipping weight. Sturdy metal frame with plastic handle holding 5 tubes in one row by means of spring clips. 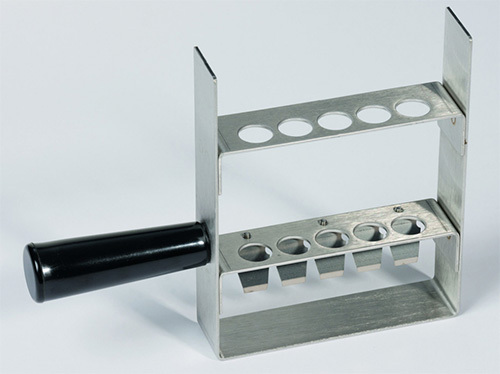 Flat ends allow holder to be set in vertical position in water bath or on table. Comes without tubes. Weights: 1/2 lbs net; 2 lbs shipping weight. The viscosity of many materials depends on shear rate and is classified accordingly, Fig 1b. Viscosity is expressed as Absolute, n, and Kinematic, v. Absolute viscosity is determined by measuring the shear force required to produce a given shear rate and is independent of the density of the liquid. Kinematic viscosity is measured by the time required for a given volume of liquid to flow through a capillary or restriction. It is related to flow caused by the hydrostatic head of the liquid and therefore strongly dependent on density. One of the simplest methods for determining Kinematic viscosity is by the rising bubble technique employing matched viscosity tubes. The method is visual, convenient, rapid and easily learned by technical and non-technical personnel. The time required for an air bubble in a liquid to rise is directly proportional to its viscosity. Bubble rise rates vary with the inside diameters of viscosity tubes; therefore, the tubes must be precision matched to a tolerance that will keep bubble rise rate variations below the level of visual detection. Variations in viscosity readings or comparisons are visually imperceptible from viscosity tubes with inside diameter tolerances closer than ±0.025mm. Any variations in readings are attributed to differences in viscosities. Viscosity is determined by either measuring the time an air bubble takes to pass between two specifically spaced marks on viscosity tubes, or by comparison to the bubble rate rise of calibrated viscosity standards. The accuracy of the method is therefore a function of precision matching of tube bores and identical score heights, which are measured from the center outside bottom. Other factors, such as uniformity of temperature and verticality of tubes, influence timed bubble travel and controlled laboratory techniques are essential for precise results. For example, a variation in temperature of 0.1°C will cause a 1% variation in the timed bubble travel, and a one radius departure from tube verticality may introduce a 10% error in the timed bubble travel. Comparison Method - The bubble rate rise of the samples is compared to samples of known viscosities or calibrated standards contained in tubes of the same dimensions. The rack containing the samples and standards is removed from the water bath, held vertically to stabilize the air bubbles and quickly inverted maintaining verticality. A comparison of air bubble speed of the samples to the standards permits estimation of viscosity; the faster the rate of bubble rise, the lower the viscosity. The user may prepare viscosity standards or employ Gardner Viscosity Standards. Time-Method (ASTM D 1545) - TimeTest Tubes are required to determine viscosity by the Timed-Method. The length of time, in seconds, required for an air bubble to pass from the 27mm to 100mm score mark, a distance of 73mm, is approximately equal to the viscosity of the liquid in “Stoke” units; alternatively, viscosity may be expressed in “Bubble Seconds.” It is important to note that the position of the air bubble in relation to the 27mm score should be similar at the end of the test on the 100mm score. Cargille Viscosity Tubes are divided into three Classes as determined by precision sorting in accordance with bore size, number of score marks and contemplated method of use for bubble rise testing, Fig. 2. The numbers assigned refer to the bore size, which is expressed in mm. Time-Test Viscosity Tubes are frequently referred to as ASTM D-1545 Tubes, which originated from the adopted standard method of test for viscosity as described in ASTM D-1545 issued by the American Society for Testing and Materials. Time-Test Tubes are scored in three places: Fig. 3a: 27mm, 100mm and 108mm. The score mark at 27mm is used for a 73mm timed travel. Time-Test Viscosity Tubes are also subjected to additional testing procedures to ascertain the 10.65mm bore which is very critical for precision measuring. 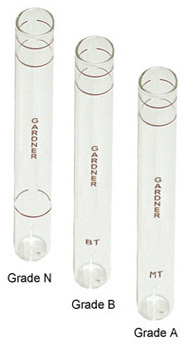 Class “G-10.65” and “V-10.75” Viscosity Tubes are used principally for direct comparisons to Gardner Viscosity Standards. Both Classes of tubes are inscribed at the 100mm and 108mm lengths, Fig. 3b. For bubble rate rise comparisons to Gardner Viscosity Standards, the following equivalency chart is provided. NOTE: All score marks are measured from the center of the outside bottom. 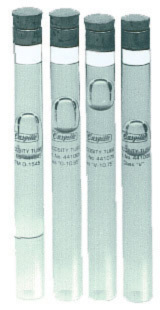 All Cargille Viscosity Tubes are permanently inscribed with two score marks, at 100mm and 108mm heights (Fig 3) with the exception of Time-Test Viscosity Tubes, which have an additional score at 27mm (Fig. 4). In compliance with ASTM D 1545, all score marks are measured from the center outside bottom of the tubes. The score mark at 100mm represents the filling level and the 108mm score is used to fix the size of the air bubble in the tube by inserting a cork to this mark. The 27mm and 100mm scores on Time-Test Viscosity Tubes are used to time the bubble rise. Cargille Viscosity Tubes are manufactured to the closest possible tolerances and then precisely measured for final selection. Note: Inside diameter tolerance closer than ±0.025mm is unnecessary since variations in viscosity readings or comparisons would be imperceptible. Tubes unsuitable for viscosity applications are separated, sorted, matched and grouped into two ranges according to tube bore size. Although these tubes are not precision matched or scored, they are adequately matched in bore size for diversified use in general industrial and laboratory procedures. 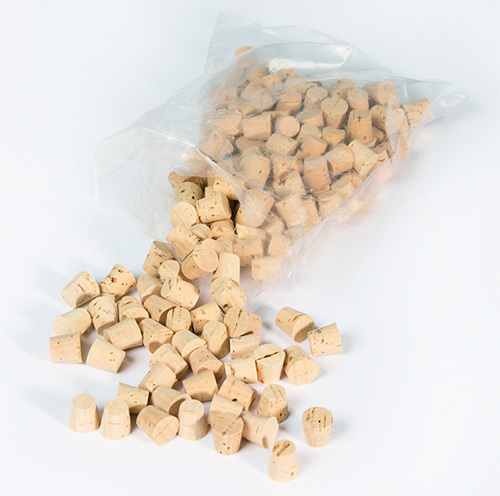 High quality, short length corks, properly fit viscosity tubes so that the small end is in firm contact with inside of tubes. Prevents small extraneous bubbles from interfering with timed bubble movement. 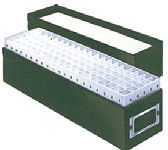 A durable, compact, solid, fiberboard Sample Storage Box with attractive dark green, moisture and abrasive resistant exterior covering holds up to 100 viscosity tubes in partitioned compartments. 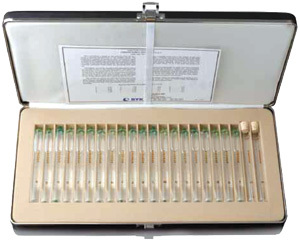 The compartments are arranged 5X20 and are alpha-numerically indexed for rapidly locating stored viscosity samples. Boxes are supplied with separate, correspondingly-numbered index charts for recording pertinent sample information, and an exterior card in a polished brass card holder for easily identifying the general contents of the sample storage box. Tubes exhibiting bore sizes exceeding Viscosity, Color and Rough Sort Tube specifications are available for innumerable laboratory applications where inside dimensional tolerance is critical. Dimensions 114mm long, approximate 12mm O.D., 0.65mm wall thickness. Critical color or turbidity comparisons are frequently affected by variations in the light path of the liquid sample. To minimize this “visual diluting” effect, tubes are available with matched bore sizes to ±0.05mm to insure replicate volume comparisons under similar light path conditions. Dimensions 114mm long , 10.80mm I.D., 0.65mm wall thickness.